I’ve heard some of them have magic button combinations that make them quieter….the default is a louder “demo” mode so they compete better for kid attention in the mayhem of a toy store. well, mine only had pull strings back in the dark ages of the 60’s. I wish I still had that GI Joe that could talk…. 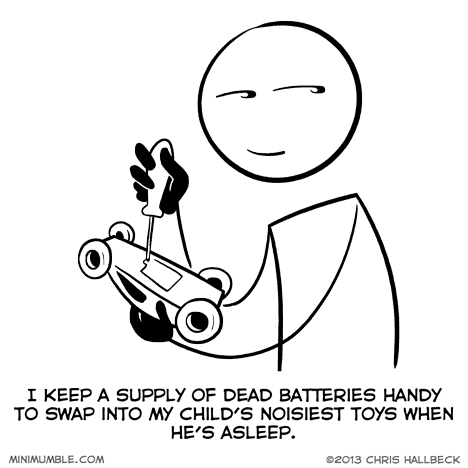 Good idea with the dead batteries. We usually just turn the high-volume-only toys off, but our daughter has learned how to turn them back on. I’ve resorted to opening the toys up and packing the speakers with paper napkins. They still make a noise but are very muted. Clear tape over the speaker. Instant sound reducer. – Source: I have a 3-year old and a 1-year old. As an electrical engineer, my first duty as an uncle was to “fix” the volume control of all my nieces toys. What’s worse than a loud toy? When your 4-year-old nephew decides to wake you up with a very loud plastic sword upside the head. You know the ones: a loud metallic “Klang!” when they hit something, followed by generic laser sounds and explosions. The sword was pretty grating, too. Never go past the shelves with the newer newborn dolls, if you’re creeped out by robot children. When boxed babies suddenly start to make their noises, it can make your skin crawl.